The how-to information provided in this workshop demystifies fundraising and helps increase your success. If you want to jumpstart your fundraising but aren’t sure where to begin, this workshop is for you! Use our fundraising assessment tool to rate your level of fundraising readiness. Small group exercises focus on what to include in the case for support and how to solicit a gift. Includes time for Q&A and discussion. 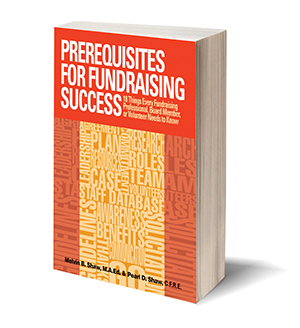 This workshop builds on information in our book Prerequisites for Fundraising Success. Workshop fee includes book for use during and after workshop.